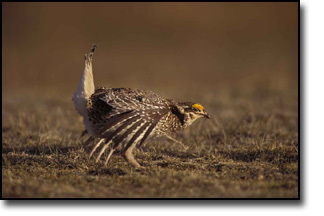 Sharptail Grouse are found in the same habitat as the Prairie Chicken and are commonly shot on the same day. We refer to the two species combined as "Prairie Grouse". The limit is currently set at 3 prairie grouse per hunter per day and 12 in possession. That three bird limit can be any combination of the two species. The percentages of Sharptail vs Chickens varies from ranch to ranch and from year to year. Some ranches will be 75% sharptail grouse and 25% prairie chicken, while the next ranch will be 25% sharptail grouse and 75% prairie chicken. Year in, year out and from ranch to ranch, our area produces about 75% Prairie Chicken and 25% sharptail grouse.